You must make reservations at least 5 minutes in advance of the time at Sun Sun - Casa Marina a Waldorf Astoria Resort. Complimentary Valet Parking for Sun Sun customers. Boasting one of the most unique dining settings in Key West, this by the sea restaurant blends marvelous ocean views with a refined menu of classic Key West cuisine, showcasing the freshest local seafood and locally grown produce. Be sure to join us each morning on for the Sunrise Breakfast, offering our Grand Breakfast Buffet with omelets made to order and other Key West inspired ala carte items..
After soaking up the sun, sand and surf, bring the day to a close at Sun Sun Bar. 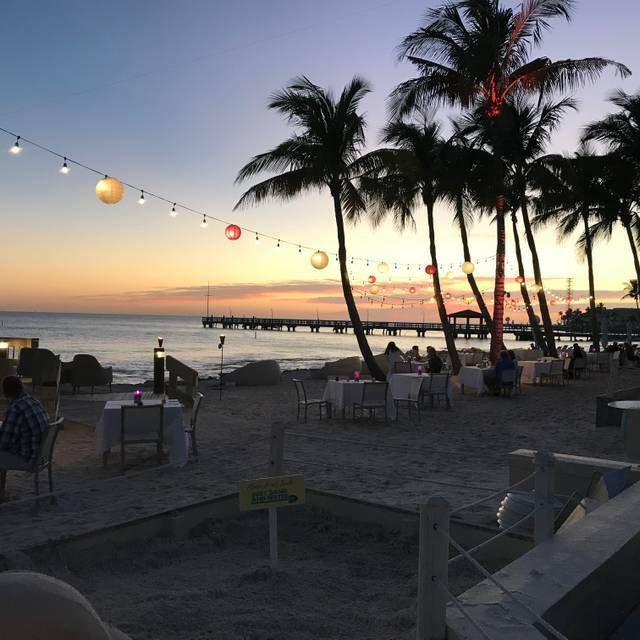 This relaxing bar features an oceanfront setting complete with swaying palm trees, warm sunny breezes and signature cocktails like the Casa Key Lime Colada and Southernmost Mojito. July 4th Reservations - We are accepting reservations for dinner service at SunSun only. There will be a minimum $75 per person Food and Beverage spend. We will not be offering General Admission seating for the evening. Please contact the Rotary Club of Key West about their exciting July 4th offerings at Casa Marina. Very nice experience view exceptional service was great! Wish we could afford to come more often. The chicken dinner my wife had was delicious. The skirt steak was good need more beef selections. Limited menu. Great atmosphere and pretty to be right on the beach. Reserved an early dinner for 4:30 but they didn’t serve dinner until 5:30. Shouldn’t have reservations until 5:30. What a treat to dine on the beach with the roll of the ocean only 10 feet away! It was a special Valentine's night and it was very fun, romantic even! The salad bar setup was unique with quality ingredients. Dinner selections were solid. The desert bar was over the top! 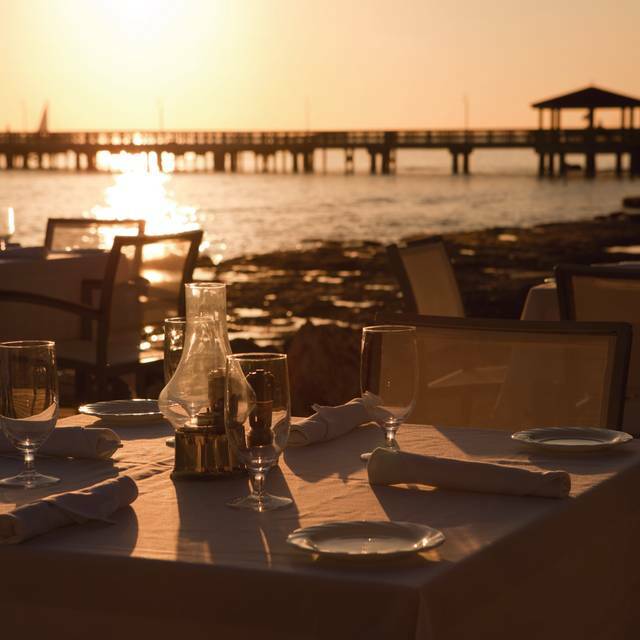 The ambience is so exquisite as you watch the sun set on the Key West horizon, that the food and service, while very good, are made sublime. The entire property is magnificent. beautiful setting underutilized with limited menu. suggest happy hour, entertainment, expanded menu, and special discounts for locals. Unfortunately one of the meals we had was inedible. We got credited for it. We visit every to years and have always had a good experience. Had dinner there for NYE. Ridiculously expensive. Completely not worth it. Lied about the menu and the set up. Service was poor . It took 30 minutes to get drinks the menu was changed at very last minute without notice . Bad music - who has country music for New Year’s Eve!!! Menu changed on New Year’s Eve without being told, after we picked our menu for New Year’s Eve. I went for NYE. Our waiter was not knowledgeable and the service was slow. Dinner was ok, just ok. The lobster was over cooked, as was our asparagus. The salad and dessert were very good but the rest of the meal was average. We spent 4 days in key west and this was by far our worst meal and we paid the most for it. The ambiance and view are outstanding. But I would never go back. The place was not crowded. I would say maybe 3/4 of the tables filled so being over capacity is not the excuse. The service was horrible. The appetizers and the food came out at the same time. Some of the meals where barely warm. I booked this restaurant because of the rating on open table. This restaurant is not close to its rating except in price. They charge like a high end restaurant, but have the quality of a mass market mid end chain with lower quality service. $780 for 5 people with drinks and the gratuity. They add it into the bill but still leave a gratuity line. They should at least high light or write additional gratuity. I enjoy high end dining and have gladly paid more than this for two people at restaurants of quality. Unfortunately this is not one. Went with the whole family to enjoy New Years Eve dinner together. Great seating on the beach, amazing deal for dinner and it was absolutely delicious!! We got there with our reservation, and they said the kitchen was backed up two hours!!! At least they told us but we left and didn’t stay. ALL the food it came out cold and had to be sent back, we were a party of seven and the wait staff couldn’t remember who got what food… The restaurant added a 20% tip for less than mediocre service… That said the ambience of eating outside by the ocean was terrific. So the value of having the ambience experience has to be weighed with cold food and slow service. The Resturant was maybe 40% full. Usually the Waldorf is better than this !! One of my favorite restaurants in Key West. One of the rare places where we still dress up for dinner. The class! Love it! Great Christmas Day buffet brunch. High quality and varied food, attentive service and bottomless mimosas very generously topped up. Everything was very good as we come here for Christmas and Easter Brunch. The only thing I was disappointed in was that the brunch had no breakfast items. They really should have them since it is a brunch. Other than that that everything was very good. The Sun Sun luau was a RIP off! First, Luau with no show. Second, $55 for a very average buffet...nothing special and you serve yourself!! Third, waitress ignored us the entire time when we tried to order a cocktail...had to flag down another wait staff. Fourth, because I was eligible for a locals discount of 15%, they tacked on a service charge of 20 %!! For WHAT service?? I waited on myself! This was a HUGE disappointment and as a local realtor, I will not be suggesting this restaurant to any visitors that happen by my office, and I've already warned all my friends at Key West by the Sea! No mention this would be an overpriced, basic buffet dinner. Food was sub par, plastic silverware and one small paper napkins. There was NO RASTAURENT !!!!! We had dinner reservation for 5:30pm They did not open until 6 and even then could only offer was a 5 item bar menu. This at a Waldorf Astoria on Christmas Eve? Plan to write a column on this and it won't be loaded with Christmas cheer. Great service interesting menu and great dinner special all very friendly, nice and very good. For the past 5 years I have made it a tradition to go to Sun Sun for Thanksgiving. I considered it one of the best values in the Keys. Not any more. The price went up 50% and the quality of the food went down. The crab legs were so soggy you couldn't crack the shells. The oysters were frozen. The ice cream was melted The Turkey was dry. I took a new guest there this year and was embarrased that I spent that much money for that terrible of a meal. I hate to end a tradition that I have enjoyed for the past four years, but I refuse to pay that much money for such poor quality food. BTW that servers were. as always. top notch! Great location. Horrible service. Overcooked food. Went for Thanksgiving dinner and were horribly disappointed. Thought we were booking the buffet, ended up with skimpy buffet leftovers off the 'special' menu, all were cold and severly lacking. Denny's on the mainland served a better Thanksgiving meal the week before. They were under staffed, so our server never had time to refill our water, let alone our other drinks, or ask how our meals were. The outdoor dining location was beautiful, but nothing else there lived up to the 'Waldorf' branding. Did Thanksgiving buffet and service was poor even though buffet. Another customer grabbed the champagne and started serving the tables an no one came by to clean up empty plates. Food was delicious but More vegan options would always be great!! The food is great, but it is the impeccable service that makes the Casa truly unique. Added gratuity for simply.bringing drinks should not be 18%. That should only be for when customer is not serving himself. The most gorgeous setting in Key West! The food, from the complimentary champagne and scallop to appetizer to entree... outstanding! Highly recommend the coconut lobster. Tiana's service was on point. We are locals who celebrated our anniversary there, & the overall experience will be so cherished & stand out in our minds forever. Can't wait be back. The atmosphere will take you breath away! Our expectations were high, hence the disappointment was big. The first problem was chicken and pigeons were free to walk on other tables waiting for quests - they literally walked and sat on each and every plate without the staff doing a thing about it. Yuck - we didn't use our bread plates, but how about those coming after we left? The second problem was food. That we thought the conch chowder was milk based was based on poor menu description and our failure to ask, but the ribs being full of bone fragments was simply poor craftsmanship from cooks part. The promised blue cheese dressing on salad starter was artificially flavored salad dressing. The chocolate mousse was a pudding. The final draw was the wine - got billed for 50% more expensive wine than we ordered. Despite the very nice setting, the food and service were way below our rightful expectations based on the Waldorf Astoria brand image and price level, and the whole evening left us with a gnawing feeling of being ripped off. Undoubtedly a very nice place for drinks. Can't recommend for dinner.